"The sun it rises..." goes an ethereal harmony from Fleet Foxes, and it couldn't have been more apt on this Easter Sunday. With heavenly voices and often forceful purpose, the Seattle longhairs faithfully recreated nearly all of their breakthrough, self-titled debut, along with music from their first EP. And while this concert fell just short of the religious experience it might have been, there was still plenty of spiritual uplift and exquisite folk-rock songwriting to marvel at. For an act so road-tested and showered with international accolades (the esteemed Pitchfork's 2008 album of the year was theirs, and the tastemaking British, they love'em), Fleet Foxes are an almost frustratingly modest crew. Arrogance is never advisable, but a bit more confidence and showmanship, especially between songs, should be almost second-nature after over a year of touring the world and playing such high-profile gigs as "Saturday Night Live." Bandleader/top Fox Robin Pecknold sang and strummed to potent effect, and his four bandmates are well rehearsed, but the prolonged silences between songs as they geared up to play their next piece constantly killed momentum and left Pecknold, and by extension, the audience, feeling a bit awkward, like a couple on a first date that are struggling for a conversation item. 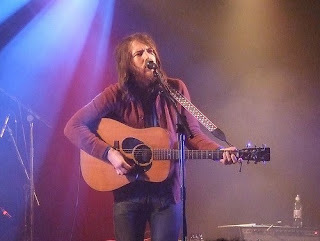 This situation did find Pecknold openly mentioning at one point how vulnerable he felt, which was admirable in its candor, but thanking your opening band at two different points during the show and begging the audience for its patience with new songs is not expected or warranted behavior from an outfit that has the world fawning at them right now. Gaps between songs aside, the quintet otherwise delivered a lush, frequently magical 75 minutes of music, churning out and harmonizing on the operatic "He Doesn't Know Why," their solemn, eccentric single "White Winter Hymnal," three promising new tunes, and several other numbers using such gravitas-instilling Biblical language as "my brother" and "your protector." Meanwhile, the climactic reading of "Mykonos" had an epic scope, and its skyward incantations were genuinely powerful. On this, the holiest of Christian holidays, Stumptown's indie rock disciples had their own sort of Easter service - a late-night revival administered by guys that looked suspiciously like JC himself but better yet, sang like angels. Opening up the evening were the Portland's current favorite sons Blitzen Trapper, who, with a winning, well-paced set, nearly gave the Seattle headliners a run for their money. Here's a gang of individually unremarkable dudes that fast exceed the sum of their parts as soon as they play together. With three sets of keyboards onstage, inventive percussion instruments (water-bird whistle, anyone?) and an overall layered sound, the group dished out a sharp, infectious batch of post-hippie rock that was organic, surprising and at times in line with such power-pop outfits as Squeeze and The Knack, if those acts wore flannel and sprang from the Pacific Northwest. Armed with rockers, ballads and singalong choruses rooted in folk, blues and jammy psychedelia, Blitzen Trapper nonetheless kept the songs compact and the instrumentation neat. The Foxes still beat the Trapper on this night, but it was a close one.